About how long should i wait after re-potting to start fertilizing again? I've been fertilizing in the first watering for nearly 40 years now. Go half strength if you worry about the nonsense about fertilizer "burning" newly cut roots. I'm sure many other "experts" will disagree; myth is hard to destroy. I fertilise after three to four weeks after repot. I'm not afraid to burn the roots as I feed with organic fertiliser. I feel it benefits the tree/root system to have to search for food the first couple of weeks. I don't fertilize after repotting, but it will be fertilized at the same time as the rest. Like if I repot one now, and it's time to fertilize the rest tomorrow or weekend, it gets fertilized tomorrow or weekend as well. I actually already stick a small basket of Osmocote onto the soil right after repotting/washing. Works fine for me, whether barerooted during repot or 30% of original soil removed, chemical or organic fertilizers (I use both). I use very fast-draining volcanic rock and burnt earth (our version of akadama here), with just a bit of coco chips as organic component, in case that is a factor. I guess a lot of my fertilizers applied today get washed out fast the next day of watering - especially those which were barerooted (i.e. almost no organic soil in the pot). I fertilize every week. JimLewis wrote: I've been fertilizing in the first watering for nearly 40 years now. Go half strength if you worry about the nonsense about fertilizer "burning" newly cut roots. I'm no "expert" but I just wanted to clarify where I went wrong with fertilizing my trees with osmocote, because in 2012, stuck a small basket of osmocote into newly potted trees, and the leaves wilted, and eventually "burned" or dried after about 2 days. Ever since then, I've been afraid to use osmocote and inorganic fertilizer in general. But if you say it's non-sense and a myth, then there's probably something I did wrong. I do believe inorganic fertilizer is a great supplement, but I would like to know how to use it properly. > Fertilizer was stuck into the soil directly above the roots giving it an overdose of nutrients. It wasn't the act of fertilizing that damaged the trees, it was the use of Osmocote. It is designed for other things. You have no control over which little capsules open when, and how many of them open at one time. Easy to overdose. Sorry you lost trees. Maybe the soil is not right (or watering) ? I did see some really 5-figure expensive Podocarpus bonsai brought back by a client to the bonsai nursery - 1 dead, 2 dying - all because of an overdose of Osmocote or similar pellets according to the master there, 4 or 5 almost full baskets in each pot ! Didn't follow instructions, and soil was organic. Walter Pall fertilizes a lot according to his article, but it has to be the right "soil" and aggressive watering. I'm definitely no expert, as I have the Osmocotes stuck close to the trunks for some whose pots are small, no problem so far. Osmocotes I use take a long time to open up and are slow-release, 16:9:12. Of course, I just give the dose according to instructions for pot size. I have some lasting for 2 to 4 months, I really won't have them as main fertilizer s they are really slow, they're just useful supplements for me. Here is a small one taken after it was just repotted, Osmocote right on top. I don't think Osmocote will even take effect fast, and if they do, they drain down fast as well. Fertilizing immediately after repotting is generally fine, especially if your using organic fertilizers. The only caveat I've found is with plants in the refinement stage. Plants at this stage aren't normally fertilized in the early spring anyway. But I have found that early spring fertilizing coupled with more room for root growth created by repotting can cause more vigorous growth than desired. JimLewis wrote: It wasn't the act of fertilizing that damaged the trees, it was the use of Osmocote. It is designed for other things. You have no control over which little capsules open when, and how many of them open at one time. Easy to overdose. Sorry you lost trees. brett2013 wrote: Maybe the soil is not right (or watering) ? Thanks for your input Brett, really appreciate it! I feel sorry that while justly debunking a myth, you propagate another one. Osmocote, and the others ferts in *cote have been primarily designed for what we are doing : growing trees in pots. The adequation of this type of ferts to growing trees in pots has been demonstrated both by hundreds of thousands of nurseries all over the world and countless academic studies. I, personnally, have been using only *cote ferts for more 14 years, put the fert as soon as I have repotted my trees and still have to see a tree dying of overfeeding after repotting. Alain, we are of like mind and practice. You guys have at it. 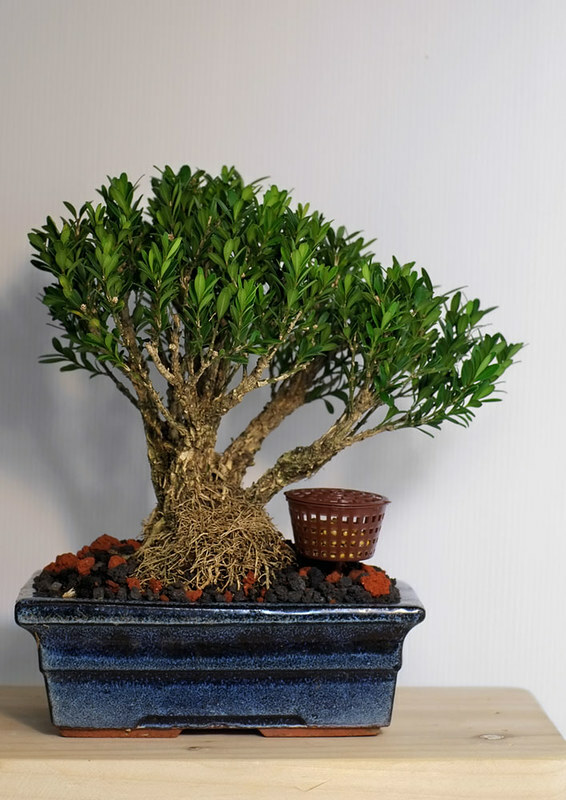 Few growers of potted plants care as much about when they fertilize as those who grow bonsai. I'll stick with a fertilizer that I know will deliver the NPK to my trees when I want it to. I use organic fertilizer once every two weeks, even on repotted trees with no trouble. No half strength dilution ever. The "burning" of roots is supposed to be due to a high concentration of minerals in the soil and not enough water, which apparently results in reverse osmosis drawing water out of the root hairs. Perhaps true in extreme conditions. I'm with Jim on this one! I use a double dose of Miracle grow fertilizer on all of my trees. But I also live in Florida and have to water frequently. I don't think osmocote (or similar time release fertilizers) is a problem in general, as I'm finding more and more bonsai growers are admitting they use them. Perhaps you got a bad batch, or the conditions (soil, weather, etc) were such that they released their nutrients too quickly...or maybe you applied too many at one time. To me, that's the biggest concern with using osmocote - the potential to put too much on. If I fertilize with a standard water soluble fertilizer, I know exactly how much of each nutrient is being applied. With osmocote, I'm never sure. I like the idea of using a small amount of osmocote to provide continuous, low-level fertilization...supplemented by regular applications of water soluble fertilizer. As for fertilizing after repotting...as someone else noted, I don't do it unless the trees are scheduled for a regular fertilizer application. In that case, I generally use a more dilute solution on the just repotted trees. I really have no idea if it makes a difference, though. Fertilization is inseparable from the substrate . abcd wrote: Fertilization is inseparable from the substrate . PeacefulAres wrote: I use a double dose of Miracle grow fertilizer on all of my trees. But I also live in Florida and have to water frequently. I do this as well and I don't live in Florida, I live in Michigan and I too water frequently. I think the myth to be debugged might be the frequency of watering as opposed to the dosage of fertilizer. Vance, I think you hit the nail on the head. Walter Pall fertilizes his trees at levels much higher than the instructions recommend, but he waters several times a day so there's no chance of the fertilizer building up and burning the roots. KennedyMarx wrote: Vance, I think you hit the nail on the head. Walter Pall fertilizes his trees at levels much higher than the instructions recommend, but he waters several times a day so there's no chance of the fertilizer building up and burning the roots. I remember when I first started showing some of my Mugo Pine bonsai I was asked how I accomplished such small needles by people that could not seem to grow them at all. I mentioned my techniques and ended with I water a lot. That standard rule at the time was to keep a pine on the verge of extinction by withholding water and fertilizer in the spring. This is the grand myth that should be abandoned. The amount and frequency of water is not the problem it is whether the tree sits in a puddle or not, and whether you perform the candle pinching/removal process in a proper manner. I apologize for the partial hijack but I believe that withholding water in order to keep the size of the needles small is a mistake. If you cannot control the size of the needles through technique you need to find a better way than you are currently using.